Rating: **1/2 out of *****. 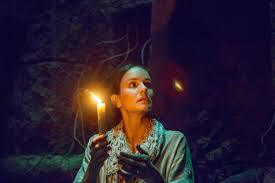 Sarah Wayne Callies is exceptional as the heroine, Maria, in the May 4th of 2016 released horror outing The Other Side of the Door. She provides an unusually strong backbone for a ninety-six minute film that often seems to echo a piece by Italian genre maestro Lucio Fulci. This is in its steady, but confident pace, and gothic tone. It also pulsates in its overall demeanor. Yet, for every instance which holds a mirror to Fulci there is a hokey sight. For example, the flick’s penchant for showcasing a child’s eyes turning black. There are just as many cheaply executed jump scares. Little of this holds any real baring on the actual narrative. The Johannes Roberts (2012’s Storage 24) and Ernest Riera (2011’s Forest of the Damned 2) penned screenplay also suffers from another near-fatal, tired trope of similar cinematic entries: myriad dream sequences. Most of these, exhaustedly, cut off a potential scream with Maria jumping up, as if from a nightmare, in her bed. Perhaps, director Roberts was attempting to inject a surreal feeling into the proceedings. It would certainly fit the atmosphere. In fact, it doesn’t entirely take away from it. But, it seems to be one of the many attributes confining an otherwise skillfully done, if conventional in theme and overall narrative, opus. Regardless, Callies keeps the work watchable throughout. This is true even when the fiction wavers away from Maria’s suffering. She has recently lost her son, Oliver (in a serviceable portrayal by Logan Creran). Such is the pushing, powerhouse force of the first act. When Maria becomes the central pawn the auteurs construct the segments of terror around in the remaining bulk of the picture: this suffering is still present in Callies’ mannerisms. Callies continues to bring depth to Maria. This is even when Roberts and Riera seem to have nearly forgotten the importance of her plight. Such transpires all the more readably as the composition progresses. Roberts and Riera tell the tale of Maria uncovering a ritual which will bring her deceased youngster back to her. The only catch comes once the ceremony, which involves a transcendent Hindu temple, is accomplished. This is that when Oliver, who passed away in a car crash which is harrowingly exhibited at about ten minutes in, is resurrected that she cannot disturb the balance between life and death. To do so, she would have to open the title entryway for Oliver and allow him into Maria’s world. Predictably, Callies ignores this warning. She keeps the knowledge of Oliver’s return between her daughter, Lucy (in a cloying, one-dimensional enactment by Sofia Rosinsky) and herself. Her husband, Michael (a routine performance by Jeremy Sisto) goes about his business. This is without the slightest notion of what is occurring. Gradually, Maria begins to realize she has welcomed an evil into the home. The theme of resurrection, even in the manner it is presented here, is well-worn ground for a terror feature. Much of the proceedings call to mind a human reversal of Pet Semetary (1983) by Stephen King. Even a late segment seems to be drawing an unmistakable parallel to the re-animated Gage Creed. We are also provided similarities to Wes Craven’s The Serpent and the Rainbow (1988). It is this familiarity which holds back the various competently done attempts at generating suspense herein. This also produces a restriction on our ability to fully become engulfed in the occurrences on-screen. What also sinks the exertion is the rote, stereotypical handling of Lucy and Michael. They are a hollow presence. Their particular personas are practically indecipherable from comparable roles in endeavors of this variety. Lucy is where this is most noticable. The writers see her merely as an instrument for faux screams and not as a singular entity. Throughout the effort, Roberts and Riera never once care enough to develop Lucy and Michael as a presence we care about. In turn, they are amended one clichéd bit of dialogue after another. They exist to stumble about while Maria solely keeps the momentum of the account pummeling forward. Distributed by 20th Century Fox, the R- rated product sports mesmerizingly bleak cinematography by Maxime Alexandre. The editing by Baxter is tremendous and only heightens the comparisons to Fulci. Joseph Bishara’s music is haunting and appropriate. Roberts’ direction is impressive. The sound department offers a terrific contribution. But, the special and visual effects are another deductive component. They are wrought of the visibly, and all too common, computer generated type. Scenes meant to evoke fear, exemplified by the final shot, only summon a raise of the eyebrow or a chuckle. Robert’s theatrical creation benefits greatly from its distinctive South India setting. The landscapes are illustrious. Additionally, its conclusion, outside of the aforementioned wrong step, is satisfactory. There is even a bit of poetry, albeit stating nothing new, summoned from it. Yet, it is still, much like the general structure of the tale itself: all too formulaic. We can see it coming once the set-up is introduced early on. On a likewise note: there are no surprises or genuinely frightful manifestations whatsoever in store. The result is a fair, but ordinary, undertaking. It is a cut above comparable configurations in veneer and in style. For most of the production, the arrangement utilizes subtly instead of excessive gore. This, again, proves the far more successful manner of constructing revulsion. But, the characters, like the jolts, could’ve been taken from any other labor of this ilk. Roberts’ opus may vaguely bring forth memories of Poltergeist (1982) at periodic intervals. 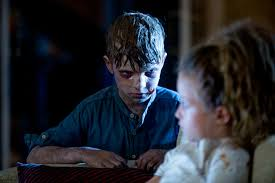 Yet, The Other Side of the Door is missing the urgency, the sense of awe and the charismatic, cut from the everyday, personalities which made Poltergeist one of the best haunted house movies of all time. Instead, we find ourselves admiring the craftsmanship. But, we there is a distance to our admiration. The cause of this is the tedious exercise in trepidation this proficiency is built around. Such makes for a hit and miss affair. The potential is abounding. Yet, the storytelling confidence is not. Of all the things that evidently restrain this photoplay: this is the most critical.